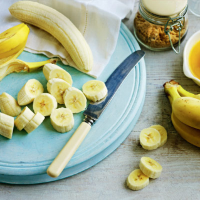 "Bananas are the ultimate snack, full of energy-giving phosphorus, plus potassium and iron - and you don't end up with sticky hands when you eat them. Once you've exposed the flesh to the air, the fruit goes brown quickly, so squeeze over lemon juice to prevent this." 1. Preheat the oven to 190°C, gas mark 5. Line a muffin tin with cases. In a bowl, mash the bananas and stir with the eggs, melted butter and milk. 2. Put the flour, baking powder, bicarbonate and a pinch of salt in a separate bowl. Add the sugar, oats and pecans; mix. Make a well in the centre and add the banana mixture; stir with a fork until just combined. 3. Spoon into the cases. Sprinkle the remaining 1 tbsp oats over the muffins; bake for 20 - 25 minutes. Leave for 5 minutes; remove to cool on a wire rack.